Podcasts are awesome, even if they may finally kill radio. You can stream them at home, or download them on your smartphone and listen to them while you’re headed to work. Plus, they cover just about every topic you can think of. The only thing not to love? There are so many to pick from. Thankfully, we’ve compiled a list of the best podcasts around — covering a variety of topics — so you can spend less time fumbling through the bad and more time listening to the good. If you need to stay up to date on the latest events, The New York Times’ podcast The Daily provides all the news that’s fit to listen to in a tidy format. Twenty minutes a day, five days a week, host Michael Barbaro guides listeners through the biggest news stories of the day, talking to experts and other Times reporters. Politics (particularly in America) can be so theatrical sometimes that it’s easy to overlook how policy decisions actually affect people’s lives. Vox’s The Impact delves into the aftermath of public policy debates, exploring how decisions — such as Seattle’s “democracy voucher” program, which gave citizens money to donate to political candidates — did or didn’t change life for ordinary citizens. This documentary-style podcast asks experts and educational professionals questions you would never think there were scholarly answers for. Are racists crazy? Can heroin be used to help stop heroin addiction? These are just a few of the topics hosts Gordon Katic and Sam Fenn explore in their one-hour segments. The justice system doesn’t always work, and podcasts like Undisclosed are there to make sure we don’t forget. Undisclosed takes the listener through the investigation, trial, and verdict of controversial cases, such as the death of Freddie Gray, with meticulous detail that makes every episode sound ripe for a multipart TV documentary. The World is Public Radio International’s daily news show. What makes it a standout is how the reports connect listeners to topics and people from around in the world in surprising ways — making bus riders in Bogota, Columbia relevant to morning commuters in San Francisco, for example — while covering some of the most interesting stories of the day. This podcast features just what the name implies — news from around the globe. It consists of a pair of 30-minute news broadcasts compiled twice a day from the 24-hours news coverage offered by the BBC World Service. Left, Right & Center is a weekly podcast assembled by Los Angeles radio station KCRW. The debate forum of the podcast allows Josh Barro, Rich Lowry, and their special guests to analyze politics, policy, and culture from every angle. The award-winning show hosted by investigative journalists Amy Goodman and Juan Gonzalez is unique in its independence. 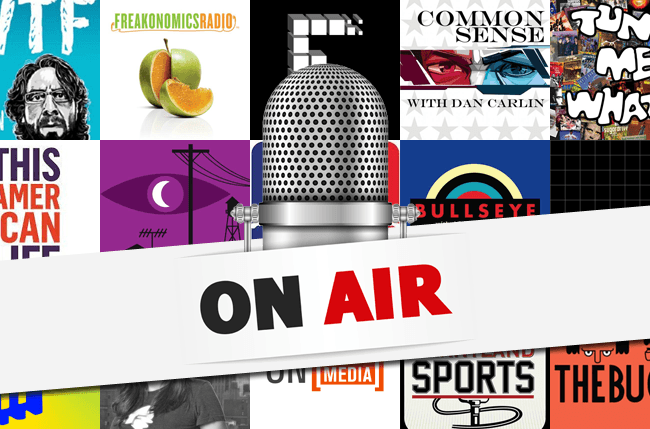 If you took media theory 101 (or you listen to On the Media), you know just how unique and important independent news media is — making this arguably the most essential news podcast of the bunch. Slate’s Political Gabfest is a weekly news roundup featuring discussions between hosts David Plotz, John Dickerson, and Emily Bazelon. Their political analysis is on point and their repartee adds some levity to the top stories of the week. The award-winning On the Media is one of the only shows dedicated to covering media news. Hosts Brooke Gladstone and Bob Garfield talk about how the news is covered, regulated, and disseminated. They examine threats to free speech, the element of transparency, and hidden agendas with both intrigue and authority. The Takeaway, hosted by Tanzina Vega and Amy Walter, offers a fresh alternative to daily news. Live reports from the field and listener call-ins round out the show and provide an extremely diverse analysis. As investigative reporting gradually vanishes from American print and broadcast news, podcasts and radio try to pick up the mantle. Reveal, the Center for Investigative Reporting’s radio show and dedicated podcast is one such example. The hour-long show, hosted by Al Letson, aims a spotlight at each topic it covers, remaining interesting and analytical while covering urgent and relevant topics. News website Vox’s podcast, The Weeds, digs into the nitty-gritty of policy thoroughly enough to satiate even the biggest policy nerds. In a conversational format, Ezra Klein, Sarah Kliff, and Matthew Yglesias discuss how policy changes the public, and in turn, how the public changes policy. This 10-part series follows Rukmini Callimachi, who covers terrorism for The New York Times, on her journey to understand ISIS. Every story is beautifully woven, capturing how everyday people can be persuaded into this terrorist organization. Callimachi, along with the series producer Andy Mills, spend countless hours and risk their lives to uncover the truth behind ISIS.